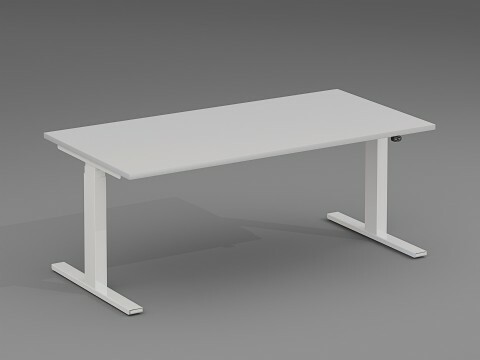 Complete Sit/Stand Desk Frame, including all the required components & connections for an electronically powered height adjustable desk frame. All our height adjustable desk frames utilise the industry renowned LINAK mechanisms and have a compact and clean design which provides optimal ergonomics in applications for office and industrial markets. These particular desks have a compact 3 part inline column which feature a 'PIEZO' integrated sensor. PIEZO (collision protection) minimises the risk for damages on a desk caused by collision with an obstacle. There are also keyhole fixation points on the top plate to facilitate the use of sliding tops. The DL12 system is controlled by a DESKLINE CBD6S control box and this new generation of control box maintains LINAK�s hallmarks of high quality systems, superb performance, pleasant sound and plug and play. The Controller supplied as standard with our Desk Kits is the LINAK DPF1K but you always have the option of replacing this with a different controller from the range, should you wish to extra features, other than the standard up/down. It is the most compact and lightweight control box in the DESKLINE series and it keeps the same width as DESKLINE columns with motor housings ensuring that it ﬁts in a desktop frame, and it is only 38mm high. From a design perspective, the control box is more intuitive and it has plugs for connection of the legs in each end of the box and it is equipped with cable grooves at the bottom making it easy to lead and hide motor cables from one side of the desk to the other. So all you need to complete your desk is a top and we have a range of top manufactured and templated specifically to suit this desk frame, so you can find these within the cross-selling options further down the page. If it transpires you're not looking for a complete desk and already have tops, then the desk frame and lots of related components are all available through our subsidiary company BPF.